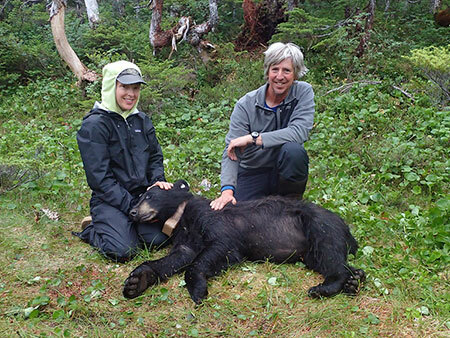 Wildlife biologists Charlotte Westing and Milo Burcham with a bear 94, the last to receive a radio-collar and one of 96 individuals captured over the past three field seasons on Esther and Knight Islands in Prince William Sound. Photo courtesy USFS/ADFG Prince William Sound Black Bear Study. Tucked into crevices and caves on two islands in Prince William Sound, about four dozen black bears are hibernating wearing GPS collars. When they emerge in the spring of 2019, these collared animals will provide insights into how bears use their habitat in Prince William Sound – when and where they go, and how it varies between males and females. Over the past three years, biologists Charlotte Westing of ADF&G and Milo Burcham of USFS have captured 96 different black bears on Esther and Knight Islands – including 25 bears this past summer. The captures themselves were a major accomplishment and provided a wealth of information for scientists and managers. The Cordova-based biologists are studying black bears in a particularly dynamic environment. Winters range from mild to extreme (a three-week storm in January 2012 dumped 18 feet of snow on Cordova, in a winter dubbed “the snowpocalypse.”). Also dynamic in terms of productivity – summer blueberry and salmonberry crops can be abundant to poor; and also in terms of human use of the region. The area is popular with hunters, and the annual harvest of black bears has trended from fewer than 100 to more than 500. The project is a partnership between the U.S. Forest Service and the Alaska Department of Fish and Game. Milo Burcham is a wildlife biologist and leads the Chugach National Forest subsistence program in Cordova; Westing is a wildlife biologist with the Division of Wildlife Conservation for the North Gulf Coast-Prince William Sound area. They outlined some of the goals of the project: Can a boat-based trapping effort capture a representative sample of bears? Are bears using habitats that make them vulnerable to hunting or do they avoid theses habitats? Are males and female black bears using these habitats differently? They’ve answered the first question – yes. Westing said the goal was to deploy about 50 GPS collars, and they accomplished that almost twice over in terms of capture success. She explained why they captured 96 bears and collared about half that number. Some of the bears will potentially be wearing the collars for three years. Westing added that every bear snared needs to be sedated or tranquilized before it can be freed, and while it may be too young and small to collar, it can provide valuable information. 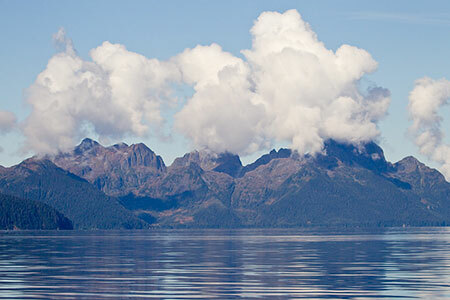 The peaks of Knight Island rise above the water of Prince William Sound. courtesy USFS/ADFG Prince William Sound Black Bear Study. Samples collected are archived, and provide opportunities for future studies – for example, a researcher could use a blood sample to look at diseases. Foot snares are an effective way to catch bears, and in July of 2018, biologists set up 13 snares on Esther Island. The snares are a bit more sophisticated than a simple loop in a cable and can be monitored remotely so biologists can detect when a set is triggered. Whether a foot snare is placed in a bucket mounted on a tree, or is on the ground in a bear trail, all are set with VHF trap transmitters that signal biologists when the snare is triggered. Each foot snare is assigned a different frequency, and a biologist can quickly scan the frequencies with a VHF radio receiver and check the pulse signal remotely through the day. That meant bears did not spend much time in the snare. When the biologists got a positive signal, the four-person capture team was assembled. Packs were loaded with animal workup gear, capture drugs and a jab stick for injections, weighing gear (an aluminum pole for lifting the animal, a scale and cargo net) and collars. The team carried firearms as well. Technically the bears are not tranquilized but “chemically immobilized.” Fish and Game researchers developed a combination of two drugs that are quite effective in tandem, and one can be reversed when the processing session is over. Processing typically took less than 30 minutes. An adult female black bear wearing satellite GPS collar. The collar collects a GPS location every five hours, and transmits locations to a satellite every two days. 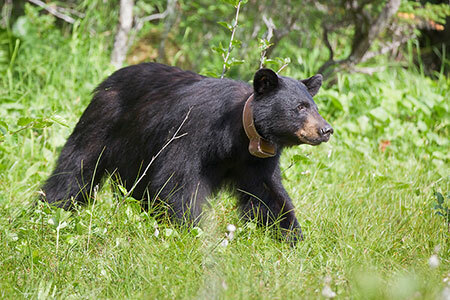 The collar is programmed to drop off after three years.. Photo courtesy USFS/ADFG Prince William Sound Black Bear Study. Westing said in 2016, the first season of captures, she used a dart gun to administer the drug. She was unhappy with the performance for a variety of reasons, and partway through the 2017 season, she switched to the jab stick. In addition to taking samples and collaring, each bear was given an ear tag and weighed. The animal was lifted in a cargo net attached to the scale and pole, and the pole enabled the team to lift the bear off the ground and get an accurate weight. One notable capture from work in the summer of 2018 was the recapture of Bear #01, the first capture of the entire project back in 2016. Her collar worked for a year and then quit transmitting in August 2017. Burcham and Westing attempted to catch her hibernating in her den and replace the collar in April 2018, but were unsuccessful. She was caught serendipitously this past summer in a foot snare near Esther Bay, on the very periphery of her home range and re-collared. Several mature males were close to 300 pounds, and the largest female was 275 pounds. Burcham said a 300-pound black bear in Prince William Sound is a really big bear. Burcham said that black bears are smaller than people think. He added that it’s difficult to judge the weight of a bear, even for the biologists. “Having trapped one hundred bears gave me an appreciation for how difficult it is to judge the size of a bear,” he said. Westing said the bears were weighed mid-summer, and could pack on more weight as the summer progressed, especially in a summer with a good berry crop. However, 2018 was not a good year for berries in Prince William Sound or northern Southeast Alaska, and biologists suspect that influenced the bears’ movements over the summer. The GPS device on the collar logs a waypoint every five hours, and every two days that batch of points is uploaded to a satellite and biologists can access the data. This has provided more than 34,000 location points so far, offering a good picture of each bear’s movements. Bears have a home range, not a territory, and they know the resources available within their home range. A preliminary assessment of 13 female bears on Esther Island indicated a home range of 10 square kilometers from 2016 through 2017. In late July of 2018, six of these bears expanded their movements, four of them moving considerable distances. 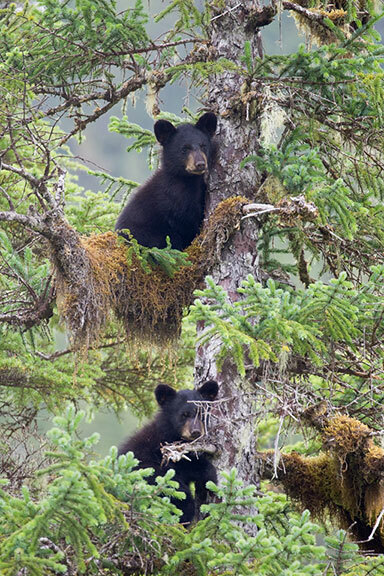 A pair of cubs watch from the top of a spruce tree while their mother is handled in a snare below. courtesy USFS/ADFG Prince William Sound Black Bear Study. “They went outside of where we’d seen them, some way outside, probably looking for food,” Burcham said. People in coastal Alaska from Juneau to Cordova reported that the blueberry and salmon berry crops were poor. That’s not something that is formally measured and documented, but Westing wishes it was. Burcham said that could explain why there were so many bears in Cordova this summer. On Nov. 15, the GPS collars went into a battery-saving mode, since the bears presumably would be denned up and not moving anyway. In this mode the waypoints are uploaded once every seven or eight days, but the connection often fails because of the bears’ location underground. The VHF transmitter in each collar is used to locate the collar when it comes off. The first collars that were deployed in 2016 are programmed to release in October of 2019, the rest will release between 2020 and 2021. Westing and Burcham visited some dens in the past two winters, to set up trail cameras and replace some collars. Westing said right now, two collars have quit working and may be replaced this coming winter. Female 02 captured on a trail camera emerging from her den with one of two yearling cubs in April 2018. Bears may lounge at their den entrance for up to three weeks in the spring. Courtesy USFS/ADFG Prince William Sound Black Bear Study. Several of the motion-triggered trail cameras were in place over the course of the summer. Burcham said they’ve documented bears visiting den sites during the summer months. In one instance, a goshawk landed near the entrance and seemed curious about the site. 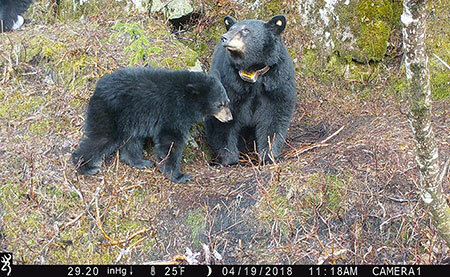 In one odd turn of events in the spring of 2018, a trail camera documented illegal hunting activity, where a bear and her cubs were killed at a den. Over the past two years, five collared bears were legally harvested by hunters. One bear died of unknown causes – in December of 2017 the signal changed to what is known as “mortality mode.” Researchers located the carcass in July and were able to retrieve the collar. With the capture sessions completed, the researchers will be collecting location data on the 44 bears wearing active collars for the next one to three years. Westing said they are now switching to a more data-focused stage of the project. “We’ve invested a huge amount of time and energy and were really happy with what we’ve found so far,” she said. Riley Woodford is the editor of Alaska Fish and Wildlife News and the producer of the Sounds Wild! radio program.